The Bluff Shelters of the Arkansas Ozarks project is made possible by a grant from the Arkansas Natural & Cultural Resources Council. 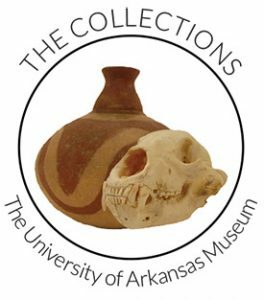 This publicly-oriented website is only one component of the grant which also funded the scanning of critical 1930s field records from the Ozark bluff shelters and linking them to the University of Arkansas Museum Collections database. All work was conducted by staff members of the Arkansas Archeological Survey whose mission is to study and protect archeological sites in Arkansas, to preserve and manage information and collections from those sites, and to communicate what we learn to the people of Arkansas. Additionally, the staff of the University of Arkansas Museum Collections (a division of the J. William Fulbright College of Arts & Sciences) were very helpful in allowing access to their archives, photos and databases which made this grant possible. 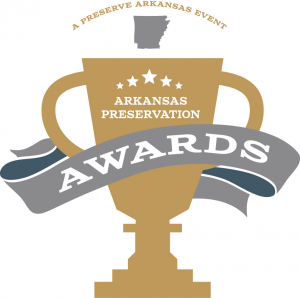 at the 2017 Arkansas Preservation Awards. Lydia Rees at Walker Shelter in Benton County. 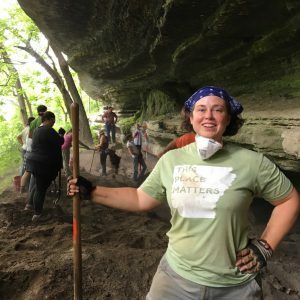 Lydia Rees was a Research Assistant with the Arkansas Archeological Survey‘s Sponsored Research Program between 2015-2017 when this website was being created. She is now a graduate student at the University of Arkansas and the University of Arkansas Museum Collections‘ NAGPRA Coordinator. Rees digitized historic field records associated with the 1930s bluff shelter excavations, linked those records to artifact databases for future researchers and created the Bluff Shelters of the Arkansas Ozarks website. Unless otherwise indicated, Rees developed all the content for the Bluff Shelters of the Arkansas Ozarks Website. Dr. Jamie Brandon is the Research Station Archeologist with the Arkansas Archeological Survey responsible for counties in Northwest Arkansas and most of the Arkansas Ozarks. By virtue of his position, Dr. Brandon is also an Associate Research Professor of Anthropology, University of Arkansas–Fayetteville. He has more than 25 years of experience in the field of archeology and has worked with the Survey in various capacities since 1997. Brandon served as the Principal Investigator for the project and is leading a multi-year research project to investigate bluff shelter sites across the Ozarks. Jerry Hilliard surveying for shelters in Crawford County. Dr. Elizabeth Horton is the Research Station Archeologist with the Arkansas Archeological Survey stationed at Toltec Mounds State Park. Dr. Horton is also a recognized authority on paleoethnobotany. She came to the Survey in 2010 as a postdoctoral researcher at the coordinating office working with perishable materials from the Ozark bluff shelter collections. She began the position at the Toltec Mounds Research Station in July 2011, but continues her research focus on pre-Columbian fabric technology and plant fiber use in the Southeast, and Arkansas in particular. Jerry Hilliard is a Research Associate with the ARAS-UAF Research Station and has been with the Arkansas Archeological Survey for 36 years. His 1980 master’s thesis used data from five bluff shelters to look at nut utilization. Additionally, he has directed many bluff shelter excavations―including work at the Narrows and the recent reexamination of Breckenridge Shelter. He has been a part of interpreting early work in Ozark bluff shelters for contemporary projects such as Craddock and Brown Bluff. 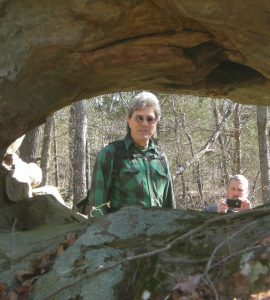 Hilliard is the author of many bluff shelter-related articles, book chapters, and monographs including The Archeology of Rock Art at the Narrows Rock Shelter, Crawford County, Arkansas (2004) and several chapters in Rock Art in Arkansas (2005). He was a key team member for the three-year, NEH-funded Arkansas Rock Art project and several other survey projects to identify bluff shelter sites in the region. Miachel Evans and Jared Pebworth at Breckenridge in Carroll County. Jared Pebworth & Michael Evans are staff archeologists with the Arkansas Archeological Survey’s Sponsored Research Program. 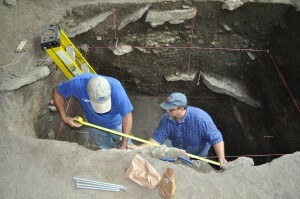 They have been with the Arkansas Archeological Survey since 1991. Their specialized skills include digital Total Station and theodolite mapping, AutoCAD and Surfer map production, data editing and management, geophysical fieldwork and data interpretation, archeological fieldwork planning and supervision, project background research and report production. Pebworth & Evans are veterans of many bluff shelter excavations including Brown Bluff, Breckenridge, Spradley Hollow, and shelters along the HWY 412 corridor. They were team members for both the three-year, NEH-funded Arkansas Rock Art project, and several other survey projects to identify bluff shelter sites in the region. Of course, much of the contents of this website is summarized from important research conducted by other archeologists. Aside from the work of Jerry Hilliard and Elizabeth Horton, who were collaborators on this project, the work of M. R. Harrington, Samuel Dellinger, George Sabo III, Deborah Sabo, Gayle Fritz, James Brown, Kathleen Cande, Randall Guendling, Charles Cleland, James A. Scholtz & Sandra Scholtz, Carol Spears, Mark Raab, David Stahle, Neal Trubowitz, David Jurney, James Rees, Michelle Berg-Vogel, and Devon Pettigrew are all used within. If you would like to read the original research by these authors, check out the Read More section of this website.